Starting with an overview on losses due to mountain hazards in the Russian Federation and the European Alps, the question is raised why a substantial number of events still are recorded—despite considerable efforts in hazard mitigation and risk reduction. The main reason for this paradox lies in a missing dynamic risk-based approach, and it is shown that these dynamics have different roots: firstly, neglecting climate change and systems dynamics, the development of hazard scenarios is based on the static approach of design events. Secondly, due to economic development and population dynamics, the elements at risk exposed are subject to spatial and temporal changes. These issues are discussed with respect to temporal and spatial demands. As a result, it is shown how risk is dynamic on a long-term and short-term scale, which has to be acknowledged in the risk concept if this concept is targeted at a sustainable development of mountain regions. A conceptual model is presented that can be used for dynamical risk assessment, and it is shown by different management strategies how this model may be converted into practice. Furthermore, the interconnectedness and interaction between hazard and risk are addressed in order to enhance prevention, the level of protection and the degree of preparedness. The research leading to these results has received funding from the European Community’s Seventh Framework Programme under grant agreement no. 262693, as well as from the Austrian Science Fund (FWF) under grant agreement no. L535-N10 and from the reinsurer Munich Re. Furthermore, the authors kindly acknowledge the support received from the Faculty of Geography, Lomonosov Moscow State University, Russian Federation, and the insightful comments of Thomas Thaler and another anonymous referee on an earlier version of the manuscript. In the Republic of Austria, the legal prescriptions for delimiting hazard zones are regulated by a national act (Republik Österreich 1975) and an associated decree (Republik Österreich 1976). The implementation of these regulations is assigned to the Federal Ministry of Agriculture, Forestry, Environment and Water Management (BMLFUW) and administrated by the governmental departments of the Austrian Service for Torrent and Avalanche Control (WLV) and by the Federal Water Engineering Administration. In § 8b of the Forest Act of 1975, the delimitation of hazard zones in catchment areas prone to natural hazards such as torrential floods or avalanches is prescribed. In § 11, the compilation of hazard maps and the involvement of communes and population are regularised. The contents and designs of these maps are specified by the decree associated to the Forest Act (Republik Österreich 1976). 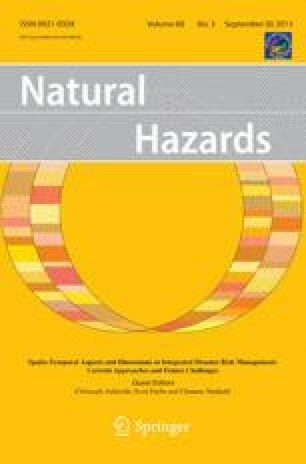 According to § 5 (2) of this Decree on Hazard Zoning, all available data and information on natural hazards as well as interactions between individual hazard processes have to be considered during the compilation of hazard maps. Furthermore, interferences with the human environment, such as infrastructure facilities and settlements, have to be taken into account. Hazard maps are typically based on the area of an individual community and should be compiled in a reproducible manner to allow for validation during the approval process by the Federal Ministry of Agriculture, Forestry, Environment and Water Management. Hazard maps are based on a design event with a return period of 1 in 150 years, and an event occurring more frequently with a return period of approximately 1 in 10 years (Republik Österreich 1976). In § 6 of the Decree on Hazard Zoning, the criteria for delimitation of hazard zones are prescribed. According to these prescriptions, red hazard zones indicate those areas where the permanent utilisation for settlement and traffic purposes is not possible or only possible with extraordinary efforts for mitigation measures, whereas detailed economical figures of such efforts are not given. Yellow hazard zones indicate those areas where a permanent utilisation for settlement and traffic purposes is impaired by hazard processes. Furthermore, specific other areas have to be displayed in the hazard maps: (1) Blue colours mark areas to be provided for future mitigation measures, (2) brown colours indicate areas affected by land slides and rock fall and (3) purple colours indicate areas that can be used as protection due to their natural properties, such as protection forests or natural retention basins.